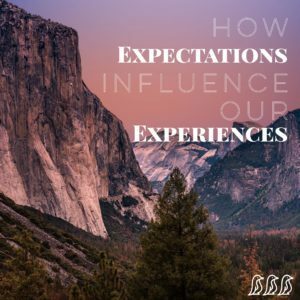 Our expectations can heavily influence our experiences, & the thing that made this abundantly clear to me was the birth of my second son. He will nap a lot. He will spend time in his baby swing. He will breastfeed at regular intervals. He will sleep in his crib at night. He will be happy to hang out at home. The reality, of course, was a rude awakening. Throughout the first few months, there would be entire days where he didn’t nap. If he did fall asleep, I couldn’t put him down & even naps in my arms only lasted about 30 minutes. He would tolerate a bouncy seat, baby swing, or other device for 5-10 minutes; but that was about the extent of that. 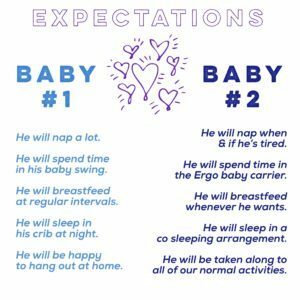 He ate around the clock, & if I tried to stick to some semblance of a schedule, he screamed & screamed & screamed until he was too worked up to breastfeed. He never, ever slept a full night in his crib. Some days the only way I could get him to stop crying was to leave the house & give him some change of scenery. Looking back, I now understand why. My first born has grown into an incredibly brilliant, energetic, & determined young boy, & all of the signs of that were there from the day he was born (when he spent his first day awake & alert holding his head up off my shoulder to look around instead of snuggling & sleeping). But… that first year as a mom was very difficult for me, & a lot of it was because I expected it to be something different. My expectations & everything I had prepared for were shattered, & instead of accepting my new reality, I fought it, & I had blamed myself. My expectations for baby number two were obviously very different. I had a different perspective… I knew first-hand how difficult motherhood could be. I knew that there were babies out there that rarely slept & always ate. And I knew that it would all be okay. He will nap when & if he’s tired. 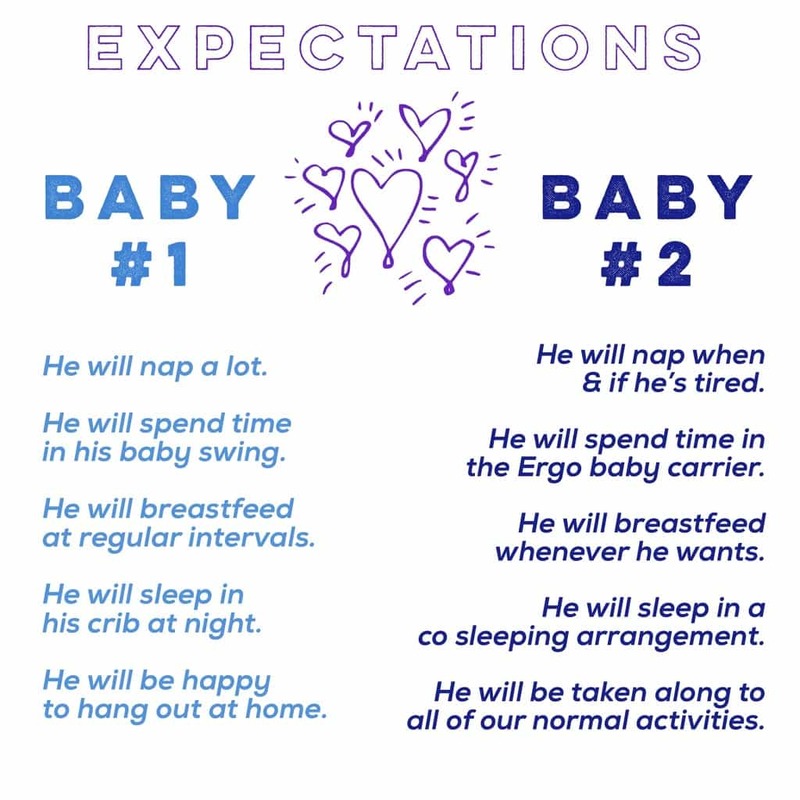 He will spend time in the Ergo baby carrier. He will breastfeed whenever he wants. He will sleep in a co sleeping arrangement. He will be taken along to all of our normal activities. So guess what… those first few months with baby number two went much more smoothly than the first time around. Part of it has to do with his happy-go-lucky personality that still exists today, but it also had A LOT to do with my expectations. If he sat happily in his swing for a few minutes, I was pleasantly surprised. If he took a good nap, I was delighted. If he went more than an hour without breastfeeding, I rejoiced. Stop fighting the situation that you’ve been given & start adjusting. You will become a much happier person!